Southwestern Coast Tidal Flats is part of the Tentative list of Republic of Korea in order to qualify for inclusion in the World Heritage List. I visited this tentative WHS in April 2017 after a 2.5hr drive from Busan. I visited the Suncheon Bay Wetland Reserve which is also recognised as a Ramsar Wetland of International Importance. The elevated wooden walkways without railings over the muddy tidal flats reminded me of Plitvice in Croatia. The sheer amount and variety of different species of crabs was impressive since their food supply is abundant. I also managed to spot a number of waders (also a pair of Spoon-billed Sandpipers) and warblers. The highlight species though were the mudskippers, amphibuous fish with limbs! The reed walks and hides are pleasant but good digiscopes, binoculars and patience are required to be able to get a glimpse of the more interesting birdlife. The famous viewpoint at sunset from the Mt Yongsan Observation Platform is well worth the 1.3km uphill hike. The mudflat area of Korea's western coast is one of the world's top five mudflats, ranked alongside the eastern coast of Canada, the eastern coast of the United States, Germany's North Sea coast, and the mudflats of the Amazon River basin. The mudflat results from the prolonged accumulation of sand or clay carried by tidal currents from the ocean seabed. It is hidden underwater during high tides and revealed during low tides. An interesting feature of these mudflats is the purification of contaminants that flow into the ocean. After contaminants produced by factories and homes seep into the ocean, the mudflat's sedimentary layer filters them out like filter paper. The filtered substances are then broken down and cleaned by the plant and animal life of the mudflat. It is said that the purification ability of Korean mudflats is 1.5 times stronger than that of all sewage treatment plants in the country combined. Over 70% of the oxygen on Earth is produced not by forests but in the ocean by phytoplankton through photosynthesis. Because each gram of mudflat mud contains hundreds of thousands of phytoplankton, the mudflat is able to produce more oxygen than a forest of the same area. For this reason, Korea regards these mudflats as a true natural wonder. Upon visiting Suncheon Bay I quickly came to the conclusion that these highly diverse tidal flats may be the best chance for Korea to gain another natural world heritage site. As one of the most beautiful places in Korea, I am now very interested in visiting some other tidal flat sites in Korea. 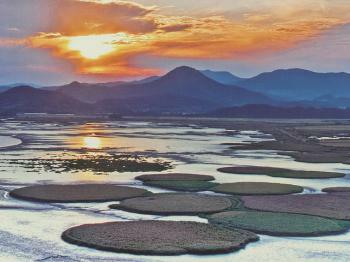 Besides Suncheon, there are 5 other major tidal flat locations in southwestern Korea. I expect this nomination to make a strong case at the 2019 or 2020 WHC. 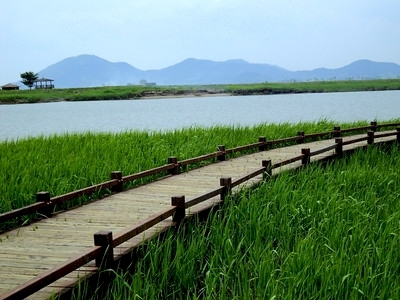 Suncheon Bay is pristine and picturesque. The tidal flats are home to a diverse range of species, from various types of crabs, to a multitude of common and rare birds. This important coastal wetland was registered on the Ramsar wetland list in 2006. The Wadden Sea is the obvious key site for the comparative analysis. Will Korea be able to make a case for these unique tidal flats? I noticed the criteria proposed is vii, viii, and x. While the site is truly a wonderful place to explore, it is difficult to judge the exceptionality of the property. Nevertheless, I highly recommend a dual visit to Suncheon Bay and Naganeupseong Village.